If you’ve been following the horrific wildfires ravaging our beloved wine country here in California you may enjoy a moment to take in a small piece of positive news proving art can really rally a movement for good. Enter the amazing husband/wife duo Eric Rewitzer and Annie Galvin, the founders of printmaking workshop 3 Fish Studios located in San Francisco’s Sunset District. 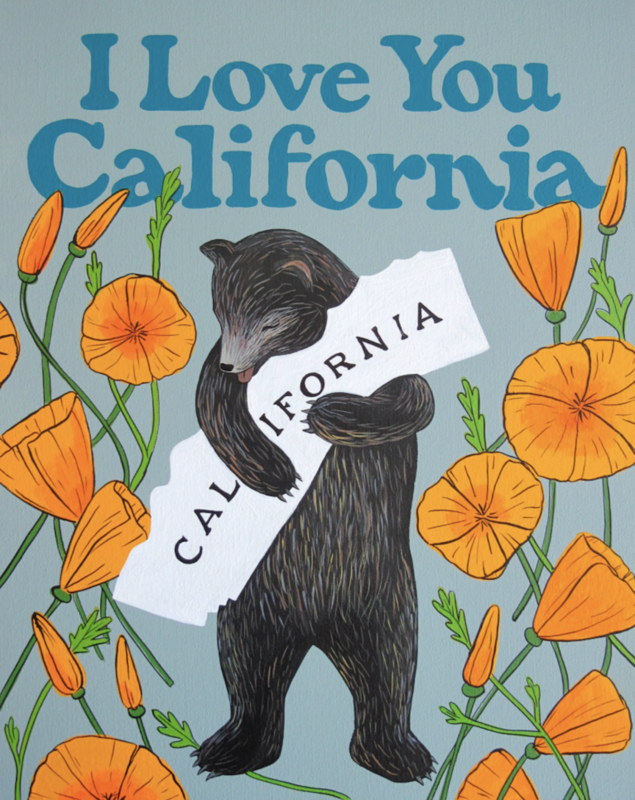 Annie created a lovable watercolor print of a California poppy rising from the ashes to pay homage to the victims of this heart-wrenching natural disaster while also doing their part to contribute to the relief effort. Through today, ALL proceeds of 3 Fish Studios iconic I LOVE YOU CALIFORNIA collection will go to support relief efforts for those affected by the California wildfires. 3 Fish have also just released a set of inspirational cards, printed on donated 16-point card stock featuring the “rising from the ashes” print. The four-card packs ($10) will also benefit ongoing relief efforts. An inspiring story from an inspiring couple doing their part to make a difference through art. Eric Rewitzer and Annie Galvin are printmakers and painters, husband and wife, and founders of 3 Fish Studios. The Outer Sunset hub is home to their workshop and studio, where art happens daily and visitors are always welcome; they love collaborating, making, and sharing creative projects with cool folks. Eric was born and raised on the industrial shores of Lake Michigan. He studied at the Cleveland Institute of Art, and moved to the west coast in 1987. Eric finds constant inspiration in the scale and diversity of the the California culture and landscape, and will forever love the mix of natural beauty, urban grit, and human diversity on display in San Francisco. Annie and Eric met in Berkeley in 1998, were married in 2001, and started 3 Fish Studios in 2007. From its original space in the Dogpatch to its now permanent place in the Ocean Beach Republic, the pair have created a dedicated space where they can make and show their work together, and invite people—neighbors and newbies alike—to do the same.